Got ubuntu 18.10 installed on the tablet. On booting up the wireless doesn’t work with similar dmesg logs to antergos. Replacing the board.bin and board-2.bin files with those from https://github.com/jakeday/linux-surface and rebooting solves the problem and wireless works. I’ve tried using those replacements in the antergos installer and removing every kernel module I could see related to wireless and ath10k then reinstalling them and it didn’t work. Maybe need to go deeper into the boot initialisation process? Or it could be some kernel differences. Could it be the country domain? but it doesn’t stick and I’ve read somewhere that atheros is picky about it. Plugged in a usb hub which let me swap some files and record outputs. Still no luck but some more info. But trying to raise wireless says resource unavailable or times out. Replaced usb with ethernet connection but couldn’t get drivers running for that either, not sure what modules I’m supposed to load. The Realtek device is marked unassigned in lspci. Probably need to boot up with ethernet connected but I need a different hub for that. So far it’s been super frustrating. Success is reported for this tablet with a tweak of wifi at: https://www.reddit.com/r/SurfaceLinux/comments/94hjxv/surface_go_first_impressions/ but the board.bin replacement file is identical in size to the one in /usr/lib/firmware/ath10k/QCA6174/hw3.0 in the iso so it might be the same already. I’ve tried removing and reading the modules using modprobe with no success. The wireless menu appears in the gui but selecting networks never finds anything. 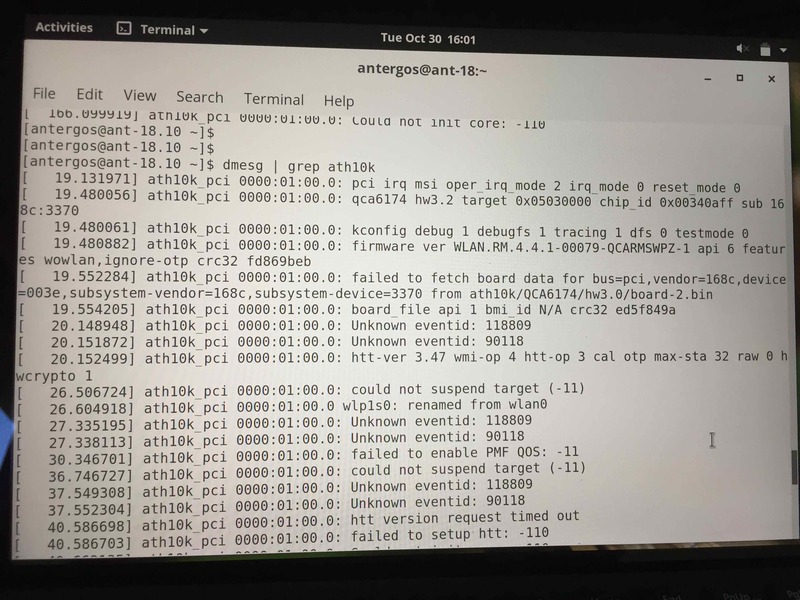 Hi, I’m trying to install antergos-18.10-x86_64 on an MS surface go and have run into an issue with the wireless. I can boot into the installer but the tablet has a Qualcomm Atheros QCA6174 wireless adapter. This doesn’t seem to be supported in the iso image. I believe there is updated firmware that can be installed but I need to install a system first and the installer requires wireless. The tablet has only a single usb-c port so can’t readily connect ethernet and the install usb.